When getting your home ready to sell, it is important to add sought-after, updated features. Buyers love turn-key homes! But, of course, you don’t want to renovate your entire home — where should you start? Here are my top recommendations on renovations to get your home ready to sell. Let’s stick with three, high-impact areas of the home — kitchen, bathroom, and front entry. The kitchen has become one of the most social rooms of the modern home. With this in mind, it has become increasingly important to stay up-to-date with the current trends to make your kitchen stand out to buyers. How can you make sure your kitchen appeals to buyers? 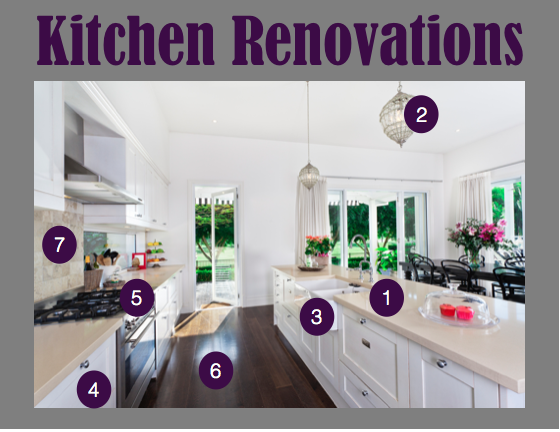 Here are the renovations I recommend to make your kitchen the talk of the market! Many buyers nowadays will not look at a house unless it has updated counter tops in the kitchen. Popular kitchen counter tops include granite and quartz. While they might be expensive, they are worth it! Granite and quartz counter tops will last longer and will add value to your home. Lighting, while it may not seem important, can add a “wow” factor to any room in the home, and pendant lights are the best option for the kitchen. Make sure they don’t overpower the room, but instead complement the features already present in the kitchen. If you have the opportunity and money, consider updating your kitchen sink. A popular option in newly remodeled kitchens is the farmhouse sink. Cabinets, just like counter tops, are very visible in the kitchen. Before you put your home on the market, make sure there are no paint chips or scratches in your cabinets. A fresh coat of paint of stain often does the trick! Also, if you want to do a little more, you can add new hardware (knobs) to the cabinets. Replacing appliances can be costly to a renovation budget. But, replacing them can be worth every penny. Stainless steel appliances are a popular choice among buyers. While flooring doesn't top the list, buyers prefer to have updated flooring in the home they are buying. Consider adding hardwood floors throughout the home (except for bathrooms). The kitchen backsplash can add a luxurious touch to any kitchen, and it doesn’t have to be expensive. Tile backsplashes tend to get pretty pricey. However, you don’t have to use tile. It turns out that tin ceiling tile makes for a great and inexpensive backsplash. 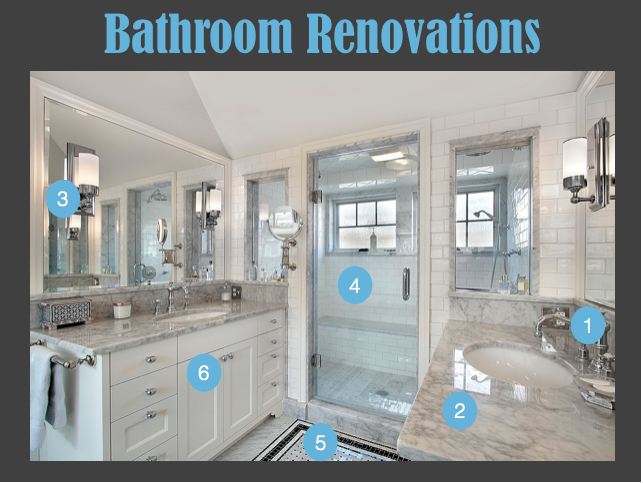 Even though the bathroom is not the most important room in the house, it deserves attention when it comes to renovating before getting ready to sell. Stick to tile, and update fixtures. As it was important to stay up-to-date with the kitchen, it is equally as important to remember the bathroom. Replace old faucets in the bathrooms before placing your home on the market. Research and see what type of metal is in style at the time — it could be very important to your buyers. If you’re going to update the counter tops in your kitchen, then the cost won’t increase much to include the bathroom. To keep it uniform, order the same counter top color. Your buyers will love that you have updated both parts of the home. Lighting is important in every room of the house! When replacing the faucets, consider replacing the light fixtures to match the new hardware. As always, remember what is in style. Big, separate showers have become very popular recently. When remodeling your bathroom, remove the tub/shower combo, and put in a standing shower with glass doors. Also, add tile to the entire shower (walls and floor). Always use tile in the bathroom - in the shower and when flooring the entire bathroom. Just as in the kitchen, cabinets are a visible part of the bathroom and buyers do not like to see them falling apart or in need of major maintenance. To keep it simple and cheap, just add a fresh coat of paint or stain. First impressions really do matter! 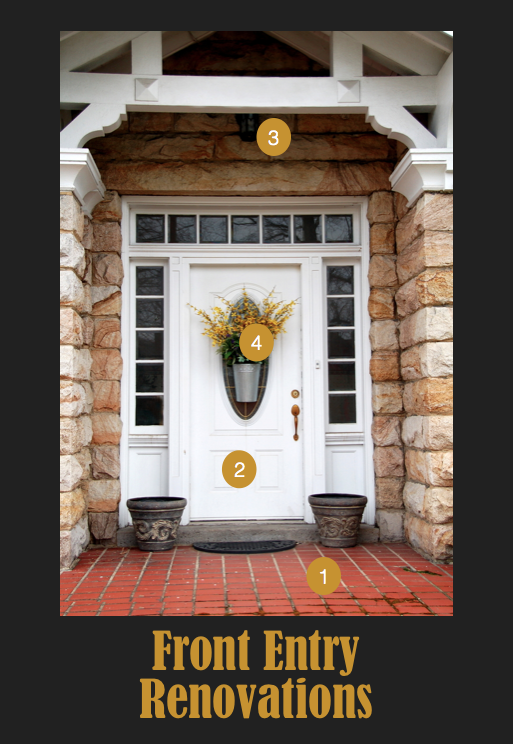 Make sure your homes exterior looks just as good as its interior — start with the front entry. My top four recommendations are below. As a cheap way to improve your home’s curb appeal, look at the flooring on your porch. Is it cracked? Or does it have missing bricks or stones? If so, you may want to look into repairing it. Adding a new front door, or refinishing the paint is important to buyers. A buyer likes to know that you take care of the outside of your home just as much as the inside. Before placing it on the market, consider replacing the door. Or, if you don’t want to spend too much, add a fresh coat of paint or stain. Replace the cheap light fixtures that came with your home and add a nice, new light fixture to the front entry. Buyers will love the new touch. When your home is on the market, it is nice to add welcoming features to the front entry. It will give buyers a great first impression of your home! Popular items include: wreaths, flowers, a welcoming mat, or new home numbers. Renovating your home to get ready to sell can be a big and expensive project. But, it doesn’t have to be. Stick to the renovations above and your home will be one of the best on the market. Let me know if you have any questions! I am always here to help you!